has this year branched out into some equally delicious treats which include cakes and even a breakfast cereal with an indulgent, French feel which are available from the website www.pierreherme.com. First there is an incredible range of extremely lemony cakes and pastries which expore the wonderful uses for lemon within this type of food. The Baba cake, with Limoncello, lemon cream, candied lemon and lemon gelée combines both the sweetness of lemon with the tart gelée, while the infiniment citron and the cheesecake infinment citron continue the theme by combining the different aspects of lemon, meringue and cream cheese as different ways of showing off the intense flavours of the fruit in different forms. 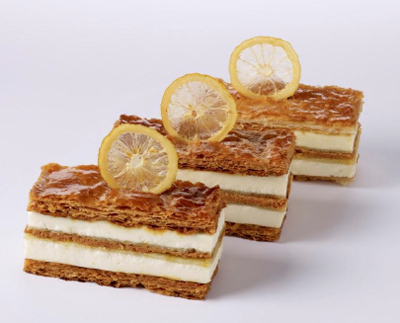 The millefeuille is a dazzling combination of caramelized puff pastry, light lemon cream and lemon marmalade which uses the very best lemons from Sicily and Calabria to achieve a new level of patisserie – this order must be placed in advance in Paris. There is also a lemon tart which uses the pulp, feel skin, zest and juice of the fruit, as well as a perfectly formed pound cake, bonbons and, of course, a lemon macaron, its cream referring subtly to lemon curd. Aside this explosion of lemon comes a line of breakfast granola made with a fascinating combination of oats, sunflower seeds, pumpkin seeds, puffed rice, grated coconut, pistachios, pecans and almonds, and flavoured with honey and rose, dried raspberries and lychees. Finally, for the perfect after-work or after-school snack, indulge in a jar of Pâte à Tartiner Pietra, an infinitely grown-up chocolate spread with a slight crunch, evoking hazelnuts and alpine winters. Find out more at www.pierreherme.com.